In my preserve making activity it was the second happy discovery for this autumn. The first was a copper pan for jam making. For several years I dreamed of making my jams in a copper pan. Now I can say that it really feels lovely, though there is no apparent cooking reason for that. Yes, the pan is shallow and makes sure the jam cooks faster and retains more color and flavor. However it's also thin bottomed, so the jam burns easily unless you really keep stirring it often. 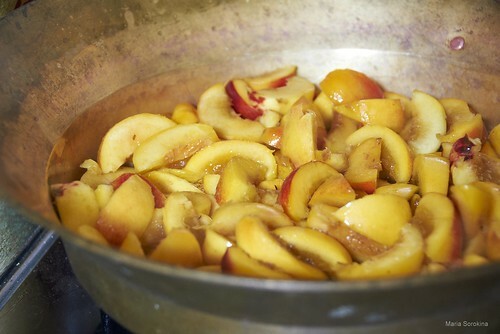 I demonstrated limited success here, so our copper pan already had to survive several caramel tinted jams, including peach, plum and apricot. It steel shines though. Maybe even more than before. 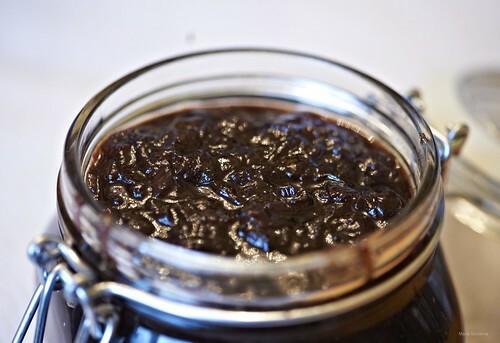 Coming back, onion marmalade is a traditional complement to many French appetizers, like cheeses and cold meats or poultry. It goes really well with omelets or simply fried eggs, possibly on a crispy toast with olive oil. It can also be a great shortcut ingredient to meat stews, which normally require very long cooking (here is Nigella's example or rapid ragu). But given all these virtues most of the time I still find myself eating the marmalade just on its own. With a teaspoon. Out of a jar. I do not suggest using a copper pan to cook it though. Just a good large heavy based steel pan will do much better. It might seem a lot, but it really isn't worth getting into this affair with less than one kilo of onions. Two kilos are even more reasonable. You will see raw onions shrinking many times as you cook and it's quite disappointing to find yourself at the end of 1.5 hour cooking with just a little jar of final product. And given how delicious the marmalade is you won't even see that jar lasting any sensible time. Yes, it takes quite a lot of onion peeling and slicing. It really helps to cut the onions lengthwise into four parts first - peeling happens much easier after. If you have a food processor with slicing ability, do use it here. I don't however and I can't say it was too hard to slice them by hand. The version I prefer is red onion with dark brown sugar, red vine, red vine vinegar and balsamic. However there are many options to turn it your way. 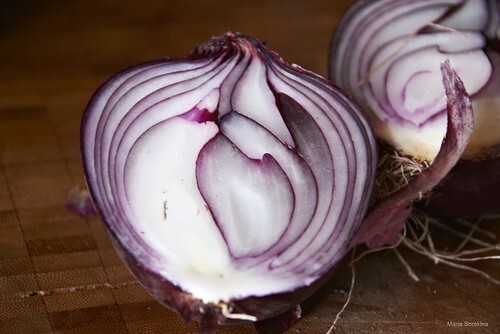 You can use yellow or white onions instead of red onions and any other wine and vinegar you prefer. Add some thyme, rosemary, coriander seeds or bay leaf. Substitute some of the sugar for honey, add some butter to olive oil etc. What will stay common is quite a simple technology, which brings out the natural flavor and sweetness of onions in a great way. You start off with cooking sliced onions in oil under lid, till they soften and start to brown. 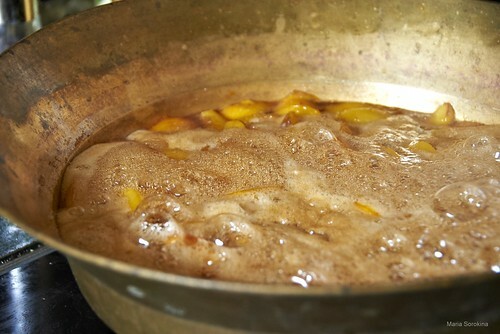 Then you add some sugar, vine and vinegar and continue cooking without lid till you reach marmalade consistency. Heat the oil in a large heavy based steel pan. 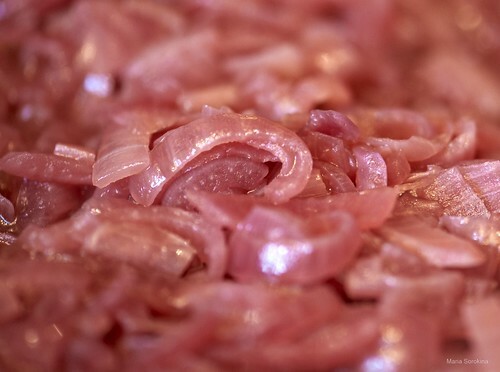 Add the sliced onions, cover and cook on medium high heat for 30 - 40 minutes, stirring from time to time, till they soften and start to color. Add the salt, pepper and spices (optional) and keep cooking under lid for another 20 - 30 minutes, stirring from time to time, till the onions get golden brown. Add the sugars, vine, vinegar and balsamic. 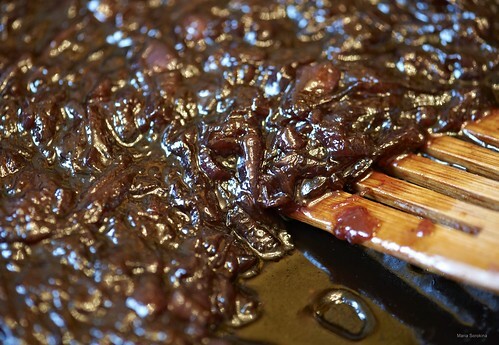 Continue cooking without lid, stirring constantly for around 20 minutes till the marmalade is thick and glossy. I do not sterilize jars properly, just pour some boiling water in, shake it up and pour out. Pack the hot marmalade into the jars. Close them tightly while it's still hot an let cool. Store at room temperature for two weeks to a month or in the fridge for longer. It gets even better after it stands for two weeks.